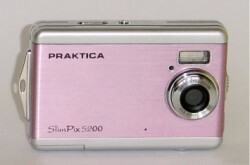 5.0 Mega Pixel Digital Camera 4 x Digital Zoom 2 inch LTPS TFT Colour Screen. Easy to customise. 85mm x 56mm x 22mm Diam. Complete with usb, battery, manual, pouch.